If you are a loyal follower of Dave Matthews Band you are probably well aware that the group has decided not to tour this year. I have personally gotten used to the group religiously playing nearly the same 60+ venues each year so this got my attention. Although a statement was released by Dave Matthews himself at the end of last year that eluded to the fact that the group would most definitely be playing somewhere and in some fashion for the fans. He stated that, "Next year, although we're not going to hop on the same train of buses and drive around North America, I have no doubt we're going to get together, whether it's in front of people or whether it's in some room somewhere, and make music together, because this is my second family." The good news for DMB fans is that his statement came to fruition in the form of the Dave Matthews Band Caravan summer music festivals. These festivals will be held at four different locations across the US running from June - September (New Jersey, Chicago, New York, Washington). The most intriguing part of these planned festivals for me personally is the band lineup for the events. Each festival stop is a three day weekend event that includes several of my favorite artists including O.A.R., Ray Lamontagne, Amos Lee, and Ben Folds. And also the best news for all music fans is the fact that a free 7-song sampler has been released featuring some of the music you will be able to hear at these festival events. 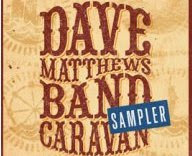 The sampler features live songs from Dave Matthews band themselves (Seven) as well as a live song from O.A.R (Untitled). The other five songs were new to me but I enjoyed the tracks from Bobby Long and Gomez. See the full song sampler offering below. There is a link below to download the sampler free from iTunes. I believe there will be more free samplers to come for these events so I will keep you posted. P.S. Who wants to go to the Chicago festival? I need to see my guy Ben Folds this year!